je suis…HairCare will be my child brand specially for Hairs. I love Hairs! But hate that i only can buy everywhere coloshade packs. I love to change my Haircolor in SL and was bored of buying 3 different color Packs so that i have 3 different Hair Colors. 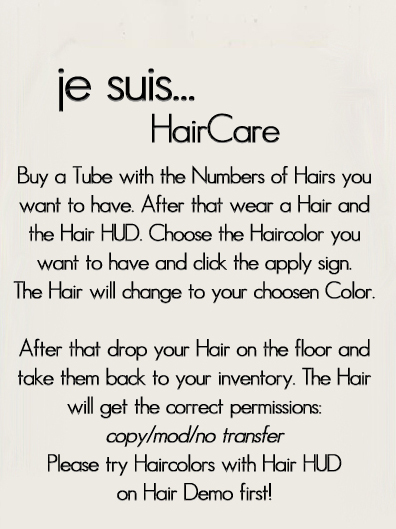 That’s why i want to offer my Customer a new System where they can decide how many Haicolors and which Haircolors they wanna have in a package.